More than 750,000 fragments larger than a centimeter are already thought to orbit Earth, and each one could badly damage or even destroy a satellite. Last year, a tiny piece of debris punched a gaping hole in the solar panel of Copernicus Sentinel-1A, an observation satellite operated by the European Space Agency, or ESA. A solar array brought back from the Hubble Telescope in 1993 showed hundreds of tiny holes caused by dust-sized debris. Experts meeting in Germany this week said the problem could get worse as private companies such as SpaceX, Google and Arlington, Virginia-based OneWeb send a flurry of new satellites into space over the coming years. They said steps should be taken to reduce space debris. Getting all national space agencies and private companies to comply with international guidelines designed to prevent further junk in orbit would be a first step. At the moment those rules—which can be costly to implement—aren't legally binding. ESA's director-general, Jan Woerner, told The Associated Press on Friday that so-called mega-constellations planned by private companies should have a maximum orbital lifetime of 25 years. After that, the satellite constellations would need to move out of the way, either by going into a so-called 'graveyard orbit' or returning to Earth. That's because dead satellites pose a double danger: they can collide with other spacecraft or be hit by debris themselves, potentially breaking up into tiny pieces that become a hazard in their own right. The nightmare scenario would be an ever-growing cascade of collisions resulting in what's called a Kessler syndrome—named after the NASA scientist who first warned about it four decades ago—that could render near-Earth orbits unusable to future generations. "Without satellites, you don't have weather reports, live broadcasts from the other side of the planet, stock market, air travel, online shopping, sat-nav in your car," Rolf Densing, ESA's director of operations, said. "You might as well move into a museum if all the satellites are switched off." Even if future launches adhere to the guidelines, though, there's the question of what to do with all of the debris already in orbit. "We have to clean the vacuum, which means we need a vacuum cleaner," Woerner said. Just how such a device would work is still unclear. 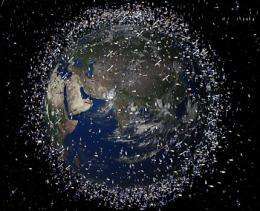 Proposals include garbage-cleaning spacecraft armed with harpoons, nets, robotic arms and even lasers to fry really small bits of debris. Luisa Innocenti, the head of ESA's "clean space" initiative, said a mission is already in the works to bring down a very large piece of debris. "It's a very complex operation because nobody wants to fail," she said. "Nobody wants to hit the debris and create another cloud of debris."